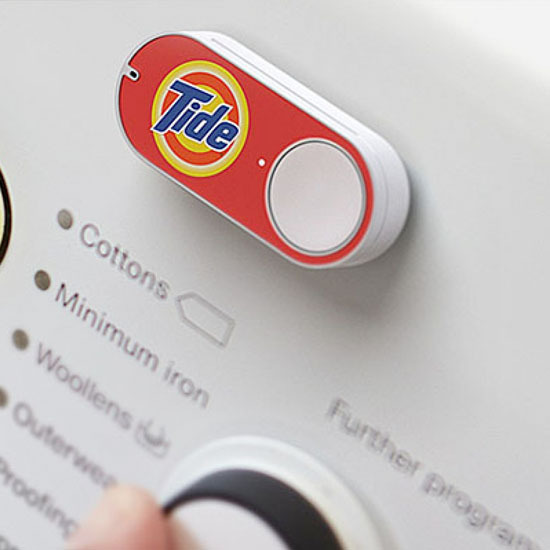 Amazon Dash is finally here! What’s Dash we hear you cry? Well, they are little buttons you stick on your appliance, and then you push so you can buy bleach and toothpaste etc. Sure washing powder and pressing buttons isn’t rollercoaster of Great British Bake Off ‘exciting’ but it is an attempt to turn your home into a ‘smartphone’. With Amazon’s service, you get branded wireless buttons, and you can hit them to purchase specific things. Unsurprisingly, you’ll need to be a Prime Customer to use the buttons. In the UK (America has loads) you can pick from 40 Dash buttons which cost £4.99 each to buy - BUT you’ll get the money back in credit for your first order. So free-ish. The buttons are linked to your Amazon account and anyone can press the button for you and you’ll get what you need added to your shopping. So keep it away from you and your mates after a night out! Once pressed, you’ll then get a notification saying that you have ordered something, so you can change the quantity of the order, or cancel it if you didn’t mean to press it. We’re not 100% convinced this is going to take off because, you know, the internet - but you never know. Of course, it’s very much worth checking to see if you can get a better deal elsewhere before pressing the button or you’ll end up throwing your money away because of a tiny bit of convenience? Will you be getting a button? Let us know.